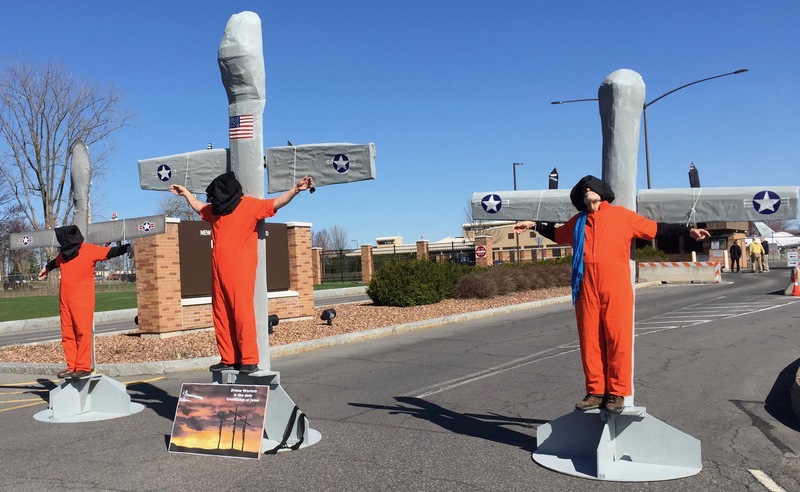 At noon on April 14, the Brandywine Peace Community held their annual Good Friday Stations of Justice, Peace and Nonviolent Resistance at Lockheed Martin in King of Prussia, Pennsylvania. Crosses laid between banners and signs, while a bell of peace tolled. 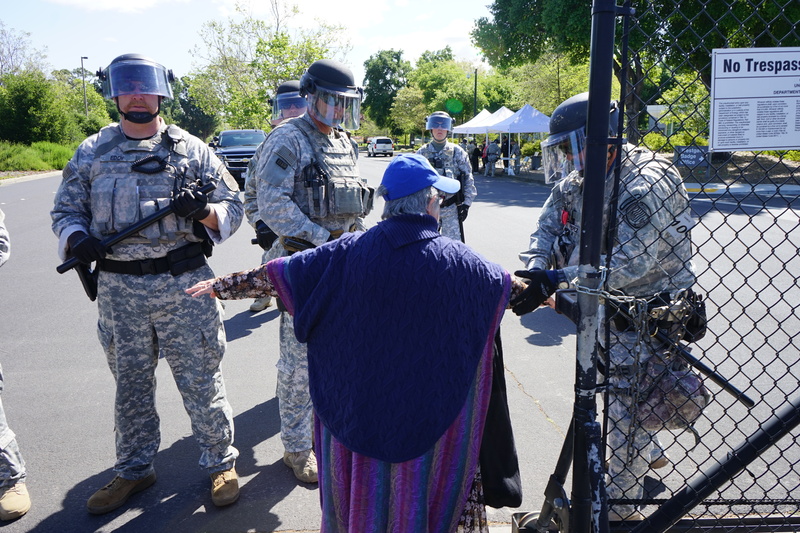 Each station had a reading not of today, but for these times (for all times) ranging from Chief Sitting Bull to Sojourner Truth, Howard Zinn, Dr. King, Bonhoeffer, Dorothy Day, Daniel Berrigan, Bob Marley, Jimi Hendrix, William Penn, Gandhi, Jesus. The backdrop was war, forever more war: U.S. cruise missiles attacking Syria, a near-nuclear bomb (the mother of all bombs) dropped on Afghanistan, the threat of nuclear war with North Korea. Lockheed Martin, the U.S.#1 war profiteer, the world’s largest arms producer, was the obvious place for us to be on Good Friday. Understood? 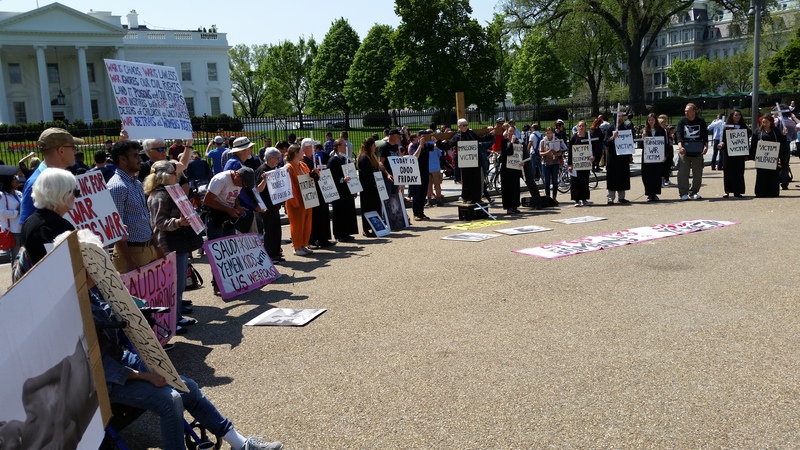 From Holy Thursday afternoon to Good Friday afternoon, some 20 friends gathered in Washington, D.C. for a Faith and Resistance retreat and public witness that was organized by the Dorothy Day Catholic Worker and held at St. Stephen and the Incarnation Church. Those who participated in the retreat/witness included members of Jonah House, the Atlantic Life Community and students from Loras College from Iowa. The theme of the retreat was: “Standing With the Crucified–Stop Crucifixion Today.” Holy Thursday was a day of reflection, sharing, action planning and Liturgy. 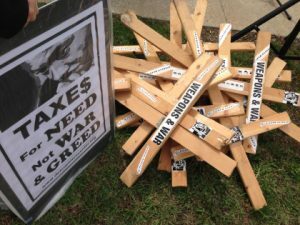 Good Friday was a day of public witness. 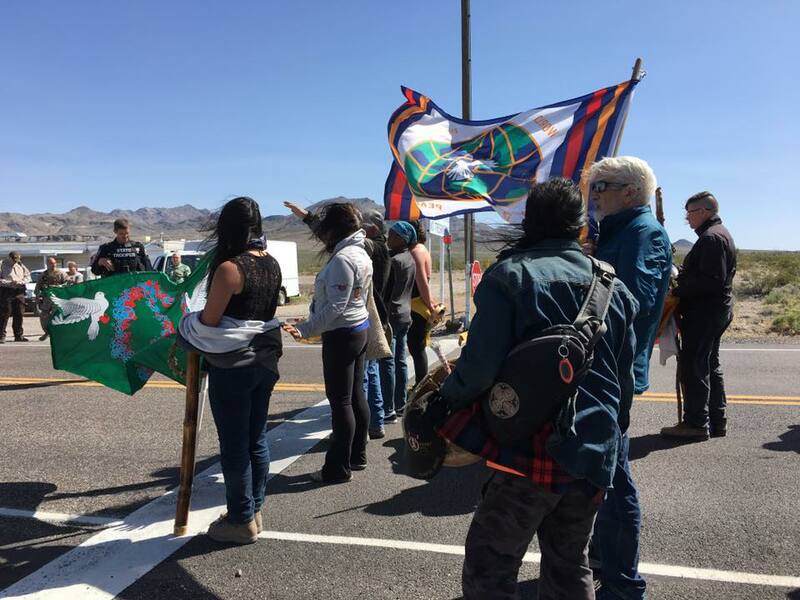 The Nevada Desert Experience held its 23rd annual Sacred Peace Walk (SPW), which happens every year during Holy Week. On Saturday, April 8, the SPW began at the Atomic Testing Museum, and continued through the Las Vegas Strip and Fremont Street. 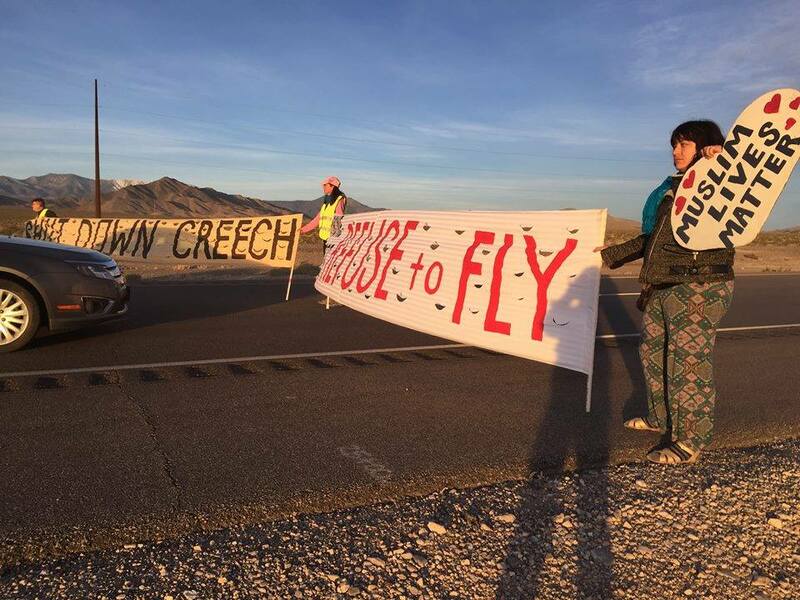 The Maundy Thursday finale for the interfaith group on April 13 was a foot washing ceremony at the Nevada National Security Site (NNSS), followed by a prayer-action at the white line on the public road leading into the nuclear test site. 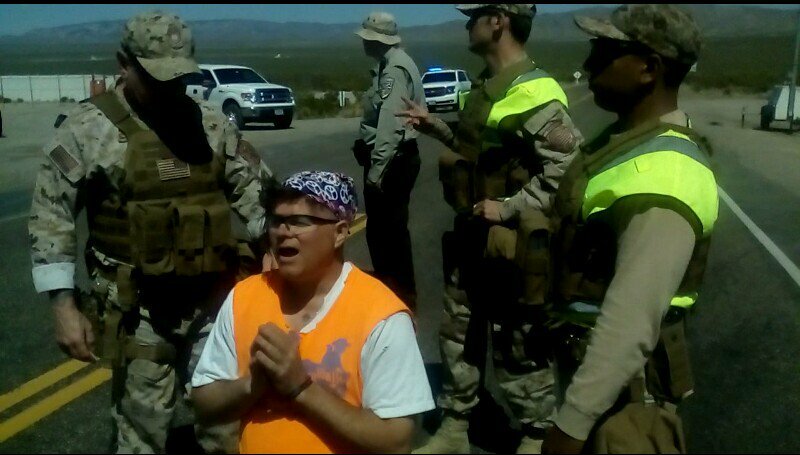 Sixteen people were arrested by Nye County sheriffs. The NNSS continues to receive shipments of so-called low-level nuclear waste. Since the site is on Western Shoshone land, the prayer-activists carried Shoshone permits granting them the right to be present at the NNSS. Nine peace activists were arrested on April 14 during a Good Friday witness against drone warfare at Hancock Air Base in New York. 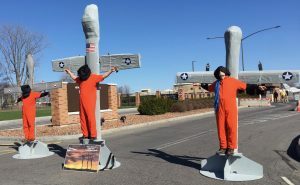 While blocking the entrance into the base, some of them stood with arms outstretched against replicas of cross-shaped drones, while others held cut-outs of drones topped with signs, some of which read “Drones Crucify Love”, “Drones Crucify Families”, “Drones Crucify Due Process”, “Drones Crucify Diplomacy” and “Drones Crucify Peace”. 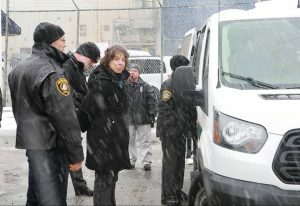 When they arrived around 10 a.m., two of the activists delivered a “War Crimes Indictment” to the guards at the guard shack. 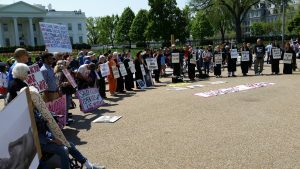 Supporters stood nearby holding a banner that read, “Whatsoever You Do To The Least, You Do To Me”. 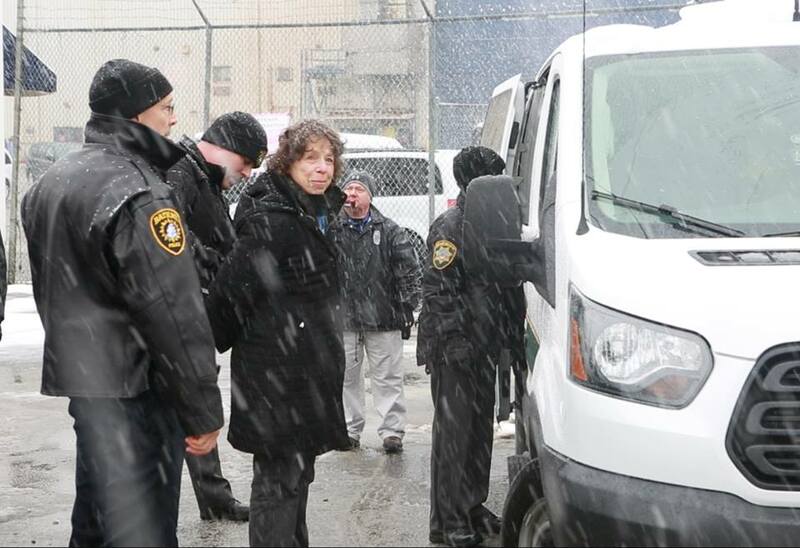 Nine activists were arrested during a snow storm on Saturday morning, April 1 at Bath Iron Works (BIW) in Maine during a “christening” of a destroyer outfitted with so-called “missile defense” systems. The group blocked the ceremony entry gate and were charged with trespass on BIW property – which ironically is ultimately paid for by taxpayer $$$. BIW is owned by General Dynamics.